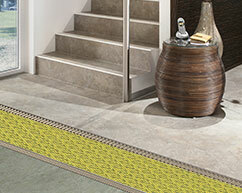 Applying a rigid floor covering to such surfaces would normally be difficult. 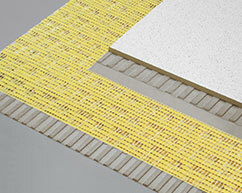 CI+ matting is a simple fixing method to achieve satisfactory results with the minimum of cost and labour. The lateral movement of such surfaces would normally cause tiles to debond or crack. 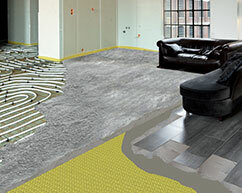 There are infinite combinations of substrates and variations in ceramics, slates, marbles and other surfaces which could be used on a project so it is impossible to provide a definitive guarantee for any specific project. However if care is taken to ensure that any vertical flexing of the substrate is removed then a very high chance of success is likely. 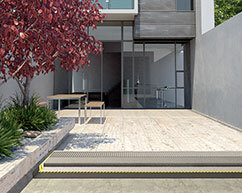 Dural is prepared to guarantee the performance of the product that we reccommend. This would always be subject to the removal of vertical flex and that all work was carried out under our fixing instructions and with due professional care and diligence. In short the product does not work miracles it can only function correctly where it has been fixed in the correct manner. Avoid vertical movement. In the case of wooden substrates a rough guide would be that any movement should be similar to that of a floor overlaid with ply. This can normally be achieved by making additional screw fixings through the original boards. Use an adhesive that will adhere to the substrate and mechanically grip the fleece on the underside of the mat. (An analogy would be as chewing gum sticks to a carpet. It isn’t stuck it has trapped the fibres of the material). 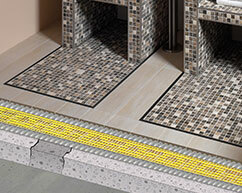 The use of flexible adhesives and grouts can be beneficial.